I fancied trying something a bit different, so I opted for a pair of Seymour Duncan P-Rails pickups in cream. The guitar is a Les Paul copy. Les Pauls come with humbuckers – big fat loud mellow bluesy low-noise pickups – think Jimmy Page or Slash. As oppose to the beautiful raw sound of single-coil pickups like you’d find in a Jimi Hendrix stratocaster. The interesting thing about the P-Rails pickups is that you can use them as a standard humbucker, but you can also play the individual coils. More toys to play with. 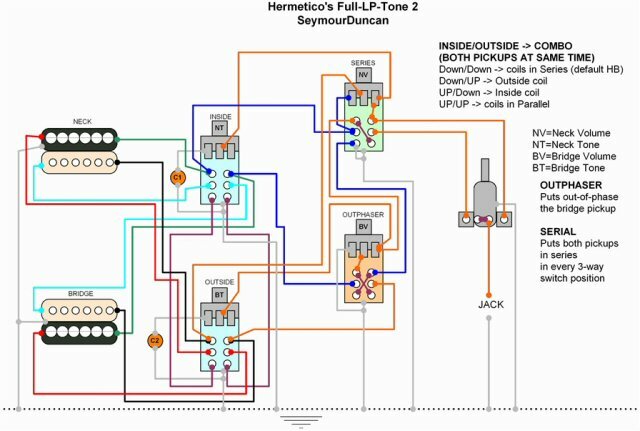 This wiring set-up devised by Hermetico gives 22 possible pickup combinations through various combinations of the pickup switch and four pot switches. I used a cheap soldering iron and pair of cable cutters, and was able to recreate the above circuit. After soldering everything I double checked each connection. 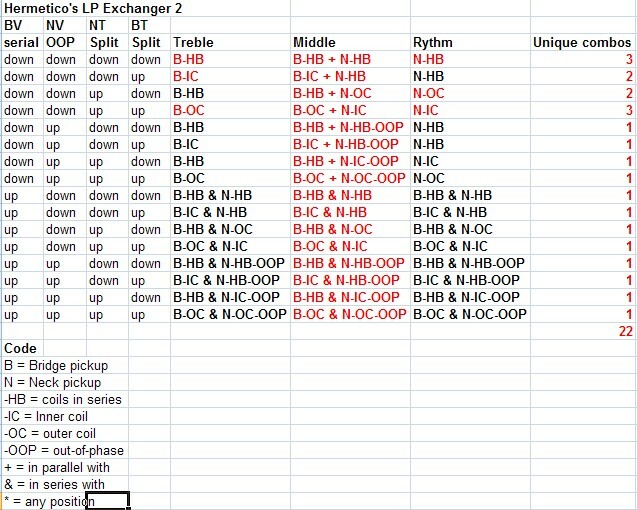 I had to make a couple of adjustments.. then stuck it all in the guitar, plugged it in, and it worked! After several weeks use, I’m of the opinion there are too many options. Also the push-push pot switches can be temperamental. So if doing this again, I would use push-pull pot switches and choose a simpler wiring set up – perhaps the triple-shot mount, or 2 push-pulls – less options but more manageable. I do really like the sound of these humbuckers though – will post a song in due course! I’ve just got my Rockwood (by Hohner) Les Paul copy back from a friend after nearly 30 years. Got a few guitars but would really love to get this playable again; trouble is, apart from the volume and tone controls and pickup switch, there is nothing inside, bar a few wires coming from the pickups and switches. Could you please tell me what components I need and, if possible, a rough estimate of the cost of these, if they can be obtained? In an ordinary guitar I wouldn’t expect to see much inside except wires and a couple of capacitors as per the ‘before’ pic above. 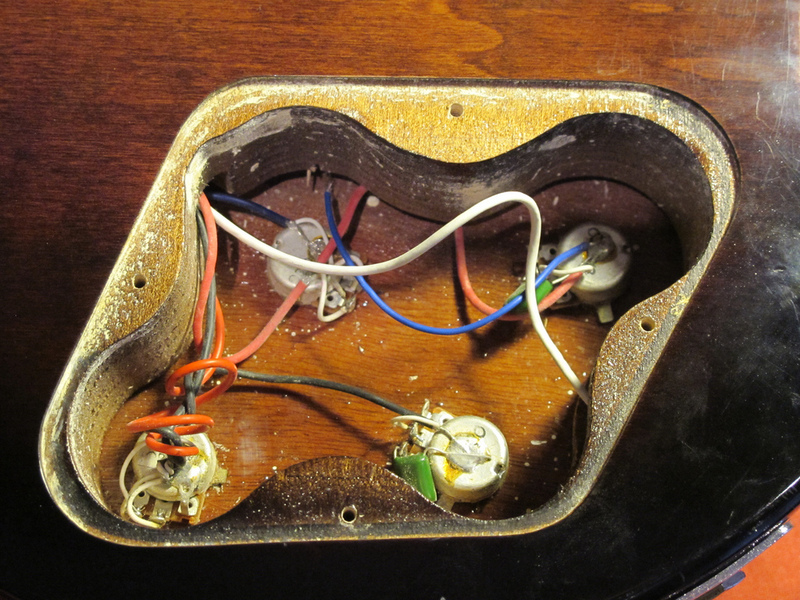 If all the components are still there it may just need soldering to repair a loose connection (check the wiring from the pickups, at the switches, and at the jack socket). 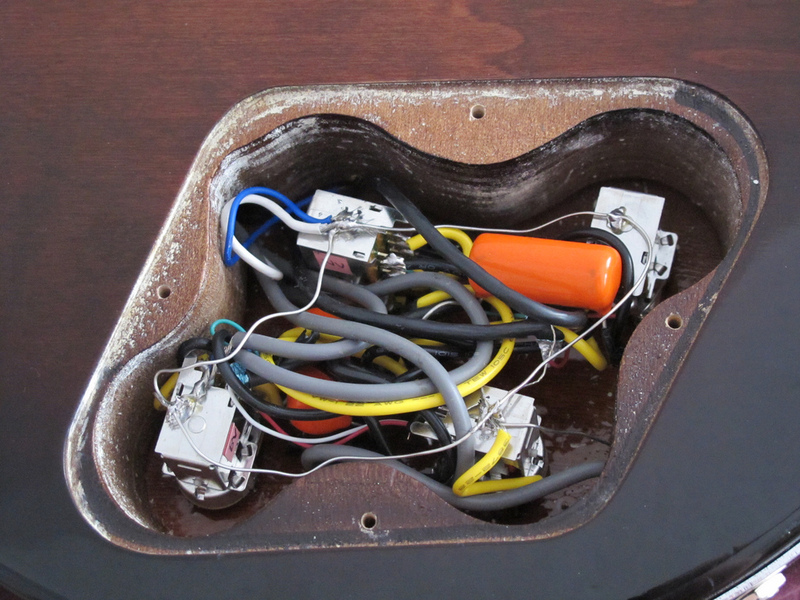 If you want to change the switches and re-wire it then you might choose to do as I did and get a kit from Axetec http://www.axetec.co.uk/guitar_parts_uk_028.htm – Good luck with your project.